This time last year, I was having a seriously granny square breakdown. Hooks were thrown, yarn bowls squeezed...it was bad :) Eventually I got it though and loved it :) I decided that since it is fall again (to me that is the month of yarn crafts) I would start picking up the art of crochet again. Last night, I started making a granny square afghan for little Miss Pita :) The colors are a mustard and cream and Im going to be binding them all together with a pink. 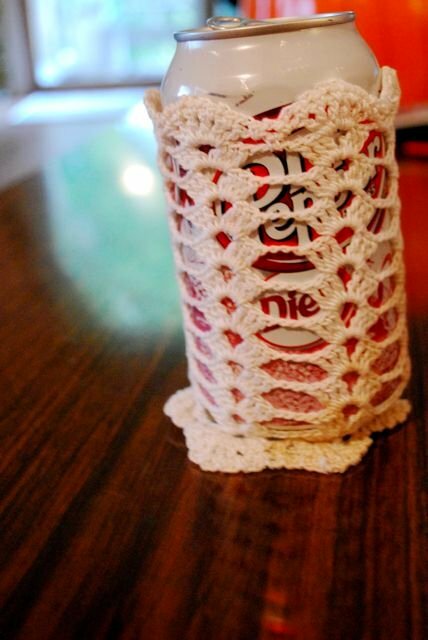 crocheted can cozies!! Super classy :) I am also using them on some cylindrical vases that I had left over from my wedding :) They really make everything look so beautiful. I love love this! I cant wait to see this blanket all finished. Pita will love it!!! Love yoU! :D that crocheted can cover is amazinnggggg. Nice job for someone who told me they couldn't crochet! I love the squares colors! 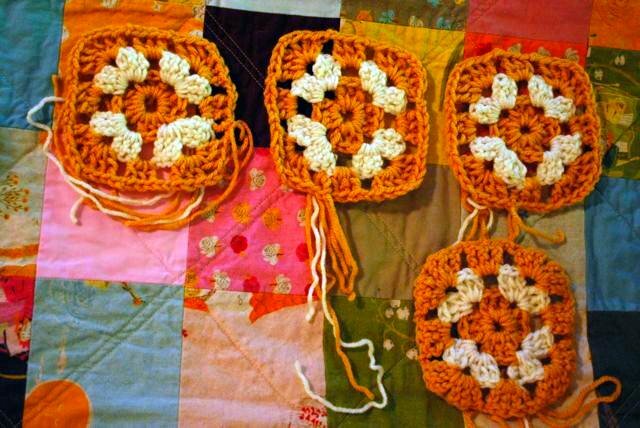 when we meet, will you teach me how to do the awesomeness that is granny squares?? pretty pretty please?? omgggggg. just so you know i'm copying the colors to that blanket one day. i'm obsessed :) your eye for color is incredible.